Just like Dorothy, the time came to return to Oz. It’s now been two days since I walked back into the unmistakeable tropical air of Brisbane. I always have mixed feelings at the end of a trip. I don’t want the freedom and adventure to end. I’d rather keep seeing new and interesting things every day. But, the flip side is the knowledge that close friends are back home, new projects await and it’s time to recharge. It’s like my mother always says – everything in life takes adjustment. Soon enough, being back in Brisbane and heading off to work will feel quite normal (in fact it already does after day one). And the silver lining is that I’ve had more memorable travel experiences, discovered new places and confirmed that travel really is a beautiful drug. It is something of a cliche, but very true for me, that travel also makes me appreciate being an Aussie and living in this country with its freedoms, easy lifestyle and bountiful sunshine. There are always moments on a trip when I think that I’m glad to live in Australia. Being elsewhere makes me appreciate it somewhat as if I’m a foreigner. You can understand why people find beauty in the wild and open spaces of this continent when they have grown up in cramped cities where the horizon line is obscured by forests of apartment blocks. So it’s back to reality and time to pack away my duck-down parka (just for a little while…). A few stand-out things I’ll miss are the crisp, fresh air of Iceland, the food in France (a highlight was a Kurdish restaurant tucked down a cobbled passageway in Paris), watching people on the metro (an eccentric madame fossicking through her handbag with vigour and urgency) and Snæfellsnes, with its snowy vista, isolation and horses. These moments, scenes and tastes are all tucked away in my mind. I’m sure the next few weeks will see me returning to them during daydreams on the bus ride to work and perhaps even at work (in the more tedious times). I’ve never taken up knitting (I broke the bobbin on the sewing machine at school and figured fabrics and crafts were not my thing) but I like Moss’ honest commentary on the time spent in, and perhaps purpose of, meetings. For me, it signifies that while we sit through our meetings and tap away at keyboards a part of us is always dreaming of the next destination. I keep a bit of a running list of areas, museums, monuments, parks, cafes and other random places in Paris that I want to visit. As usually happens, I don’t get through much on the list. Time seems to fly in this city. The last few days have taken me across the Seine and along its banks, through the metro system and in and out of a few shops. There is always more left for next time. The Arc de Triomphe was one spot I’d never observed closely. So I decided to visit the top this time. The view is, of course, not as high as the Eiffel Tower, but I think that’s its advantage – you can see arrondissements and pick out sites in better detail. Napoleon I, a keen admirer of Ancient Roman architecture, wanted a grand arch built for his army to march through, triumphant and victorious, after his success at the Battle of Austerlitz in 1805. And so the Arc de Triomphe was built. It is certainly very reminiscent of arches in Rome. Only the sunny skies and Italian lingo are missing (the scooters and cars zooming around it are on a par with the traffic in parts of Rome). 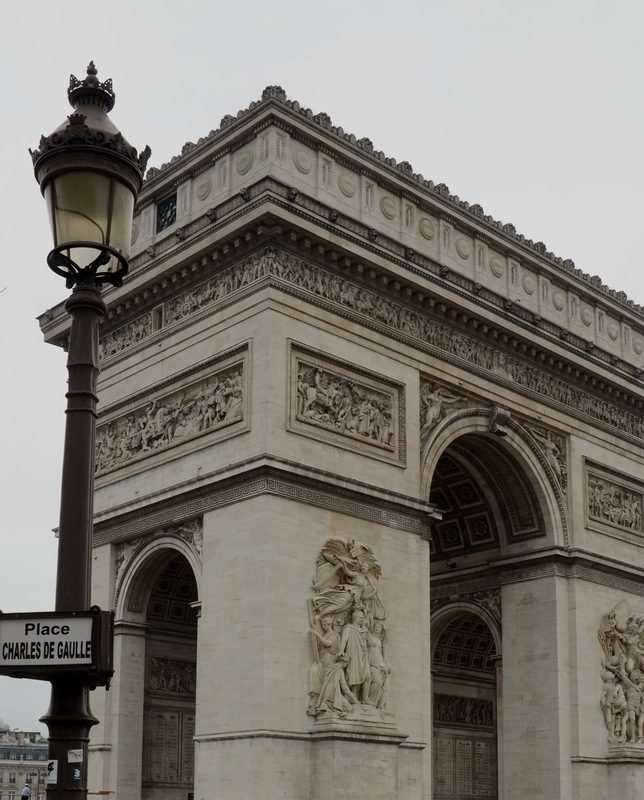 The view from the top of the structure stretched in all directions – out to La Défense, down the Champs-Elysées and on to Place de la Concorde and the Louvre museum. 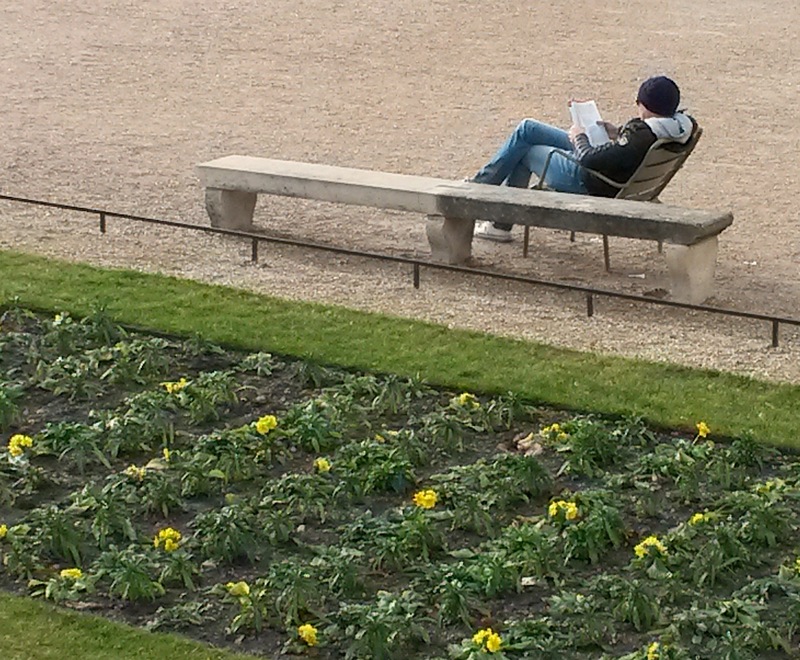 Some of Paris’ parks are also easy to spot, though would stand out more in July with their summer greenery. The Marais is one of those areas that is easy to wander through and oozes Parisian charm. There are plenty of boutiques along its streets as well. I still didn’t manage to get to Victor Hugo’s house but I did drop into the Musée Cognacq-Jay. This museum presents the mainly 18th century art collection of Ernest Cognacq and his wife Marie-Louise Jay. They were a couple fortunate to set themselves up nicely, opening the department store La Samaritaine. Their art collection is full of dainty writing tables, paintings and clocks. I spent a lovely hour there then meandered through the neighbouring streets. The Luxembourg Gardens was another area I had previously glossed over in Paris. I returned for a stroll along its gravel paths and a spot of people-watching. 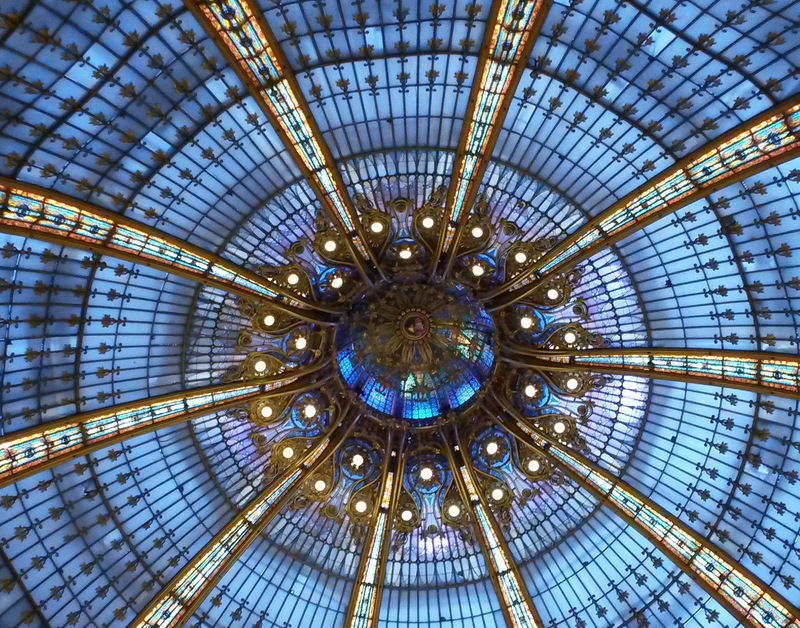 Another stop-off during the past few days was Galeries Lafayette, one of Paris’ large department stores. With the sales still continuing and stores on to their second or even third markdowns, bargain fever was in the air. It was a mammoth effort to shuffle through all the brands and racks and fight with every other female to pinch a piece of a bench to try on shoes. The interior of the building is gorgeous and worth a visit in its own right. The Basilica of Saint-Denis is on the outskirts of central Paris and is somewhere I’d thought would be very interesting to visit. It is where the kings and queens of France have been buried since about the 6th century. The sculpted figures of these monarchs, recumbent on the tombs, are particularly impressive and lifelike. Statues of Louis XVI and Marie-Antoinette, kneeling and praying, stand in one corner of the Saint Louis chapel. Their remains are held below, in the crypt. It is like standing on hallowed ground, knowing that such history, so vital to this country, is right before you. 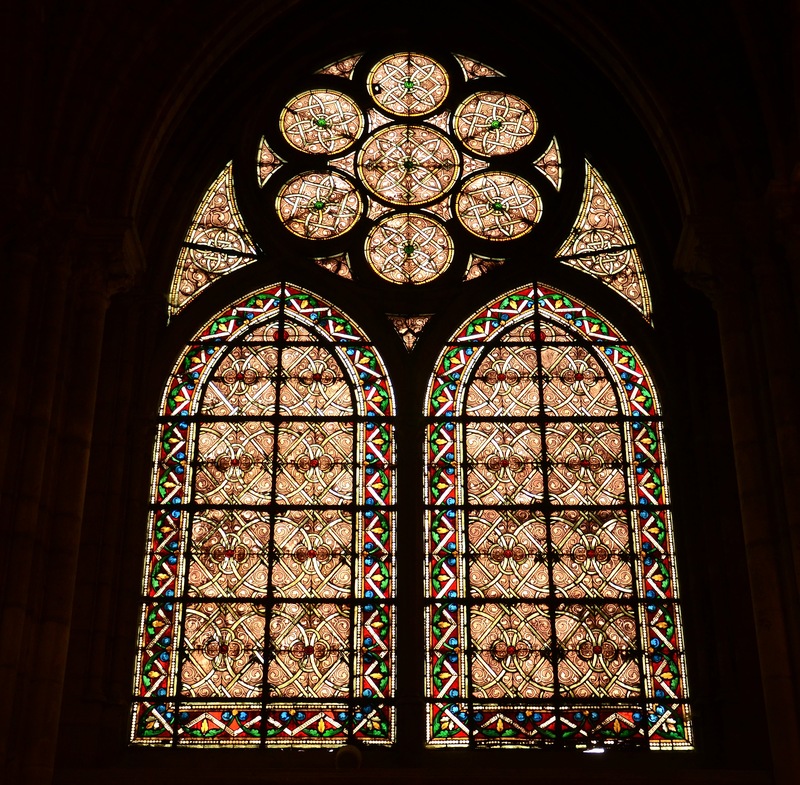 The stained-glass windows high up along the nave of the basilica were beautiful. It was my sort of church – a forest of towering columns, long narrow nave and bitterly cold but somehow fitting. 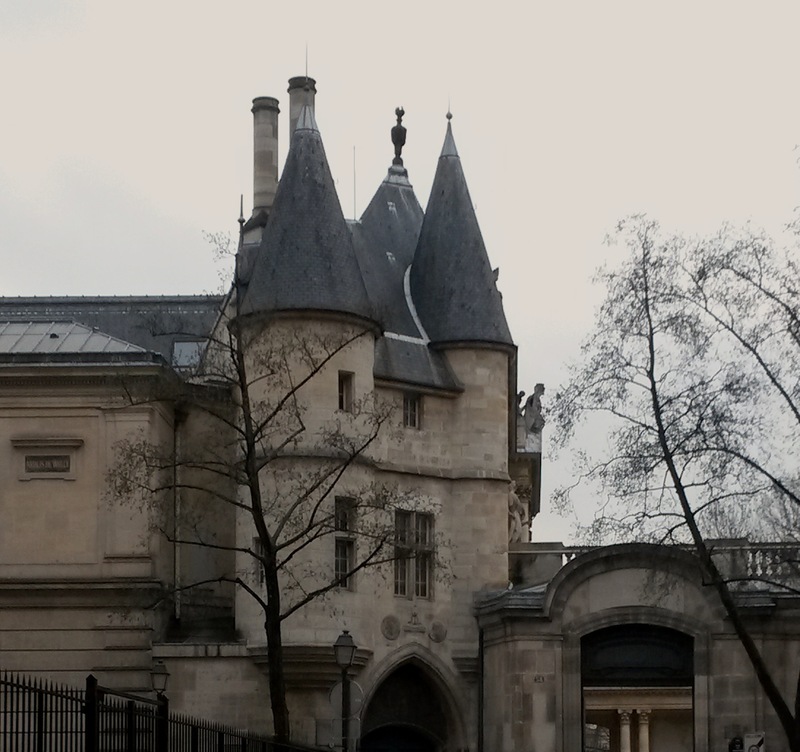 I also took myself off to the Conciergerie on a rainy afternoon. This building was originally a royal residence in the 6th century but is probably best known for its role as the prison during the French Revolution. Continuing a little with the Marie-Antoinette theme, I saw the site (now a small chapel) on which her cell once stood. One room in the complex contains lists of those who were guillotined along with their occupations. Everyone from bakers and wine merchants to ex-nobles and priests had fallen foul of the regime at the time. 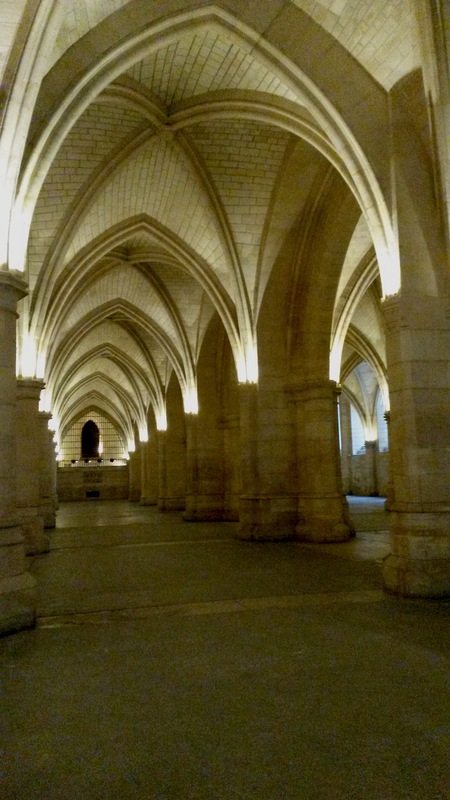 The large gothic hall, used as a refectory, at the Conciergerie was stupendous. I could imagine feasts of epic proportions once taking place there. I had a bit of an ‘Eiffel’ day on Monday. Well yes, it actually was an eyeful of the Eiffel Tower day…in a good way (can you ever have too much of this monument as a tourist in Paris?). I decided we should take the metro to Bir Hakeim even though there are other stations which land you closer to the Eiffel Tower. I wanted to walk towards it from a little way and admire the structure as it loomed closer. 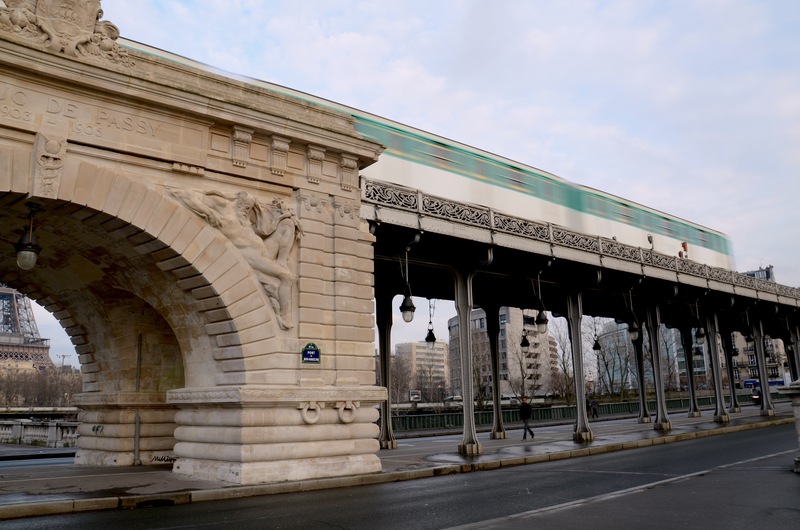 As a side note, in relation to the station Bir Hakeim, it is named after a World World War II battle in Libya in which the French defended the site against German and Italian troops. 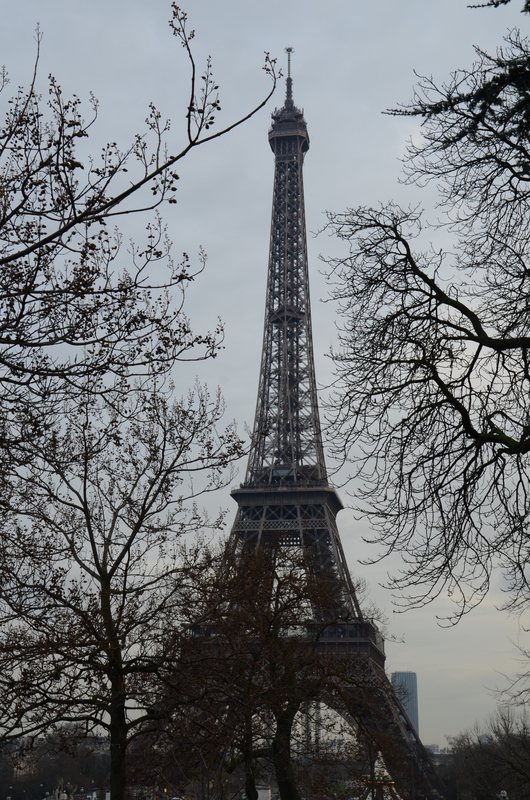 I took a series of photos of the Eiffel Tower through the bare trees on one side then walked around and took more below it, and in front of the Champs de Mars. It really is that iconic symbol of Paris and I love seeing it, whether it’s up close, above rooftops from afar or at the end of a neighbouring street. Nearing lunch time and feeling hungry we trod down the gravel (sometimes muddy) paths that curve through the Champ de Mars to Rue Saint-Dominique. I was in search of Café Constant. 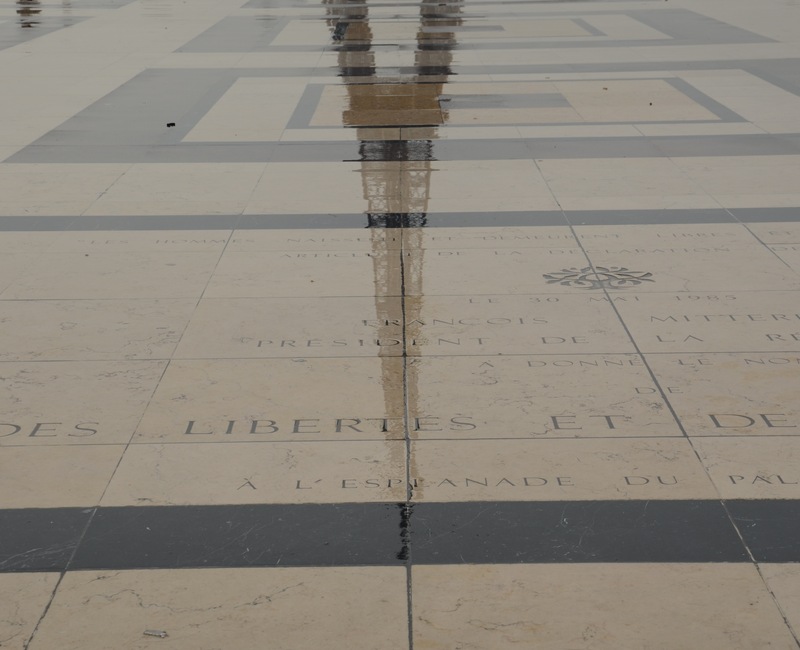 As we reached a large intersection it began raining in typical Parisian winter style – a seemingly light rain that at first glance does not require an umbrella or poncho but that manages to dampen whatever it touches. An annoying style of rain. Certainly not a tropical downpour. Arriving at Café Constant in the nick of time we de-coated in the upstairs dining room and were seated. I squeezed onto a leather bench between tightly packed tables. The three men seated at the table next to us, so close they were within elbowing distance were already halfway through their mains and glasses of red wine. Dad and I shared some foie gras to whet our appetites. I know that the method of making the foie gras is not pleasant for the poor geese involved, but it just tastes so delicious! After this spectacular sensory start our three mains arrived – chicken and ratatouille, veal and beans and my wood pigeon. It was a tasty little sucker, served with lentils and a creamy, buttery potato mash that could almost make you weep with gastronomic joy. Café Constant was top notch and I have to thank ‘Time Out Paris’ for the tip. The food was exceptional and the staff were lovely, happy to spend time discussing the dishes and wines. I was about a block from the bistro when I felt a drop on my nose. It was still raining, but this was no raindrop I’d ever felt. I had caught, on the tip of my nose and a fold of my scarf, a tiny dollop of pigeon poo. A little revenge after lunch perhaps. I dealt with this new, supposedly lucky, arrival then asked Mum to verify that my nose, hair, scarf, coat, shoes etc…were clean. 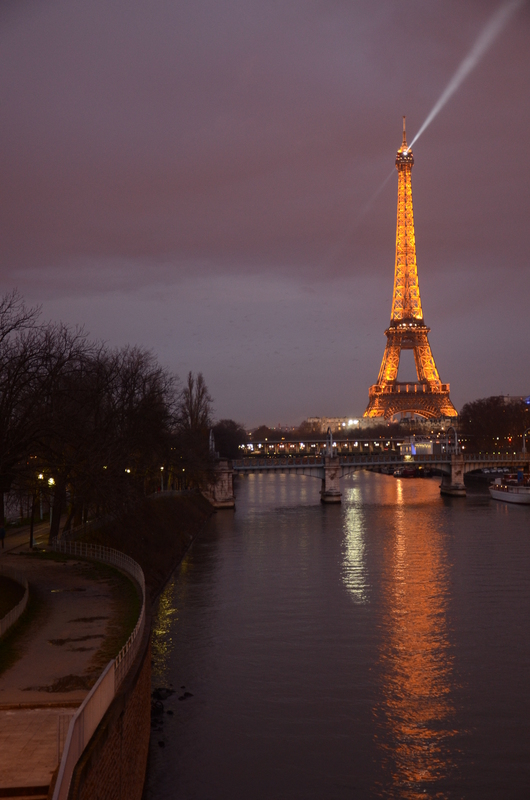 Satisfied, I continued on and we skirted the Eiffel Tower from another side then crossed the river to the Trocadéro – an elevated area opposite the tower. Some more snaps in the rain followed from this popular vantage point. The parents headed off elsewhere while I plotted my next move under the shelter of the Chaillot National Theatre. I struck out into the 17th arrondissement and wandered at leisure eventually pausing to see where I was at Place Victor Hugo. It is a busy roundabout dealing with 10 streets that feed in from every direction. Scooters zoomed around the fountains in the centre of the roundabout. Cafes, flower stalls, fruit markets, metro stations and a church crowded into the area. 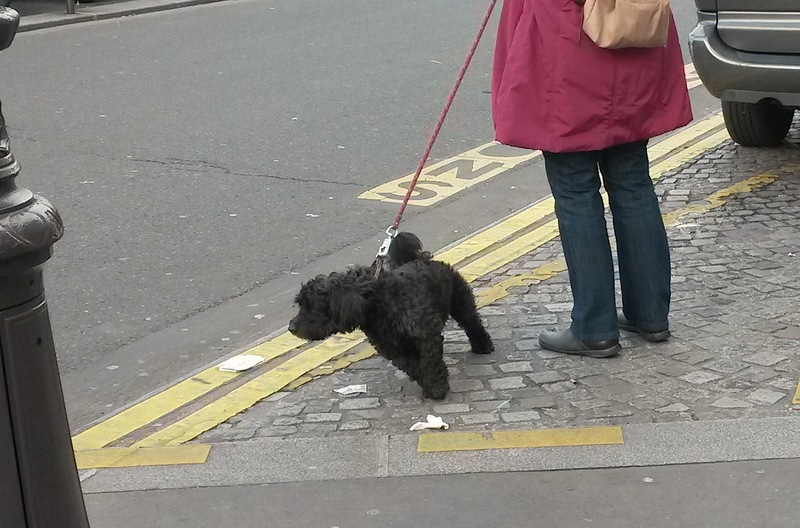 A woman clacked by in her heels, holding a lead with a tiny, yappy dog pattering along at its end. Waiters buzzed in and out of restaurants attending to customers who were busy watching the scene before them. I wandered some more, ordered a hot chocolate and pastry at a cafe and sat watching and contemplating Parisian life as it passed by outside: more small dogs being tugged along by their owners, delivery vans coming and going, tourists stopping to take photos and car horns tooting incessantly in the background. While I was charging my batteries the rain stopped and the sky even began to brighten a smidgen. 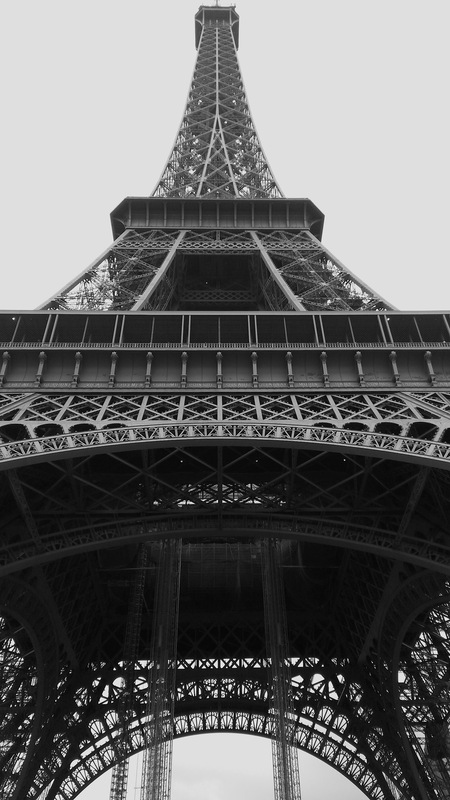 I decided to head back to the Eiffel Tower because I wanted to walk onto the Île aux Cygnes – a narrow, man-made strip of land in the Seine River. I’d never been there before and thought it might give a different vantage point of the Eiffel Tower. Once in the vicinity I walked up onto Bir Hakeim bridge and spent a while there looking at and photographing the tower from that angle. The bridge itself was a great photographic subject too. The metro runs along an elevated track supported by cast-iron pillars. I walked underneath, admiring the lines and ‘vanishing point’ effect created by the pillars. 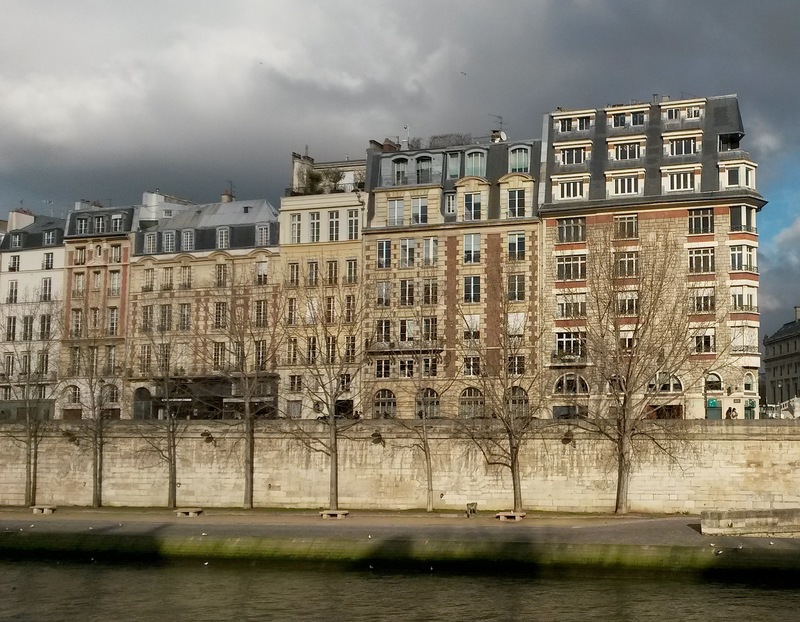 I met Mum at Bir Hakeim metro station, returned to the bridge and walked along the Île aux Cygnes. A police zodiac swept by on the Seine, turning in the water and sending spray flying. Training…or just fun on a Monday afternoon… At the southern tip of the island I met my friend, the Statue of Liberty, again. This replica was given to Paris by the American community living there, in 1889, to commemorate the centennial of the French Revolution. Also at this end, underneath the Pont de Grenelle, was a training area – fitness equipment, mini rock-climbing walls and a few toned dudes doing some of the most awesome push-ups I’ve seen. Up on the bridge we waited 10 minutes until 6:00pm to see the Eiffel Tower’s sparkly lights come on. These lights, and the far-reaching beacon that spears into the sky in two directions, are features that were added in 2000. The twinkling continues for five minutes on the hour, every hour until 1:00am. My heart twinkled back at the tower as we walked on and took a metro home. The apartment we have been staying in is sweet, warm and comfortable. However, one noticeable omission in the kitchen is a toaster. I’m a cereal and toast girl. But, forgoing my daily toast routine was not too difficult given that baguettes and pastries are in plentiful supply. So, before setting off for a day of adventures to the north of Colmar we stopped in at the homely Au pain de mon Grand-Père (Grandad’s bread) for a ficelle (shorter, thinner, and slightly twisted bread stick), two pains aux raisins (with juicy raisins scattered through the coiled pastry) and my favourite – a pain au chocolat. Of these, I will never tire. 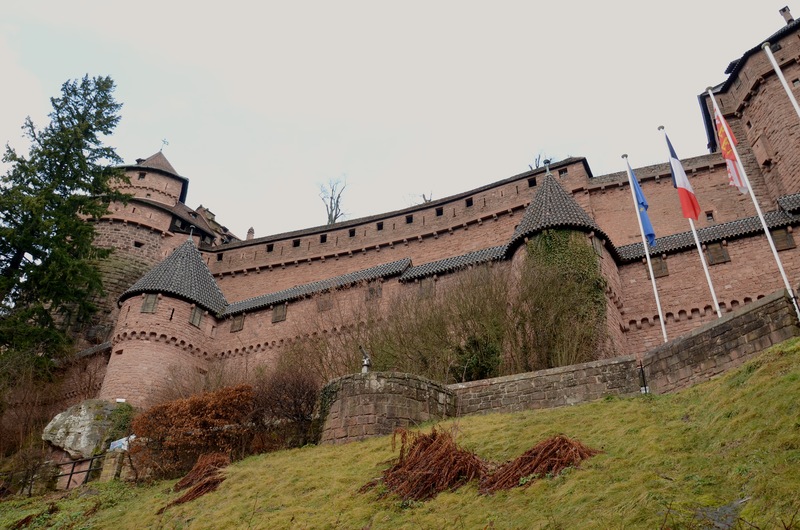 With the car now smelling like a fragrant bakery we burned up the autoroute to the Château du Haut-Koenigsbourg. This is the mother of all châteaux in the Vosges mountains. As the road looped upwards the vistas became more awesome. Some smart duke recognised the strategic position of a rocky spur up in the mountains. The castle was built on top, containing various bedrooms, a chapel, kitchen, artillery and a medieval garden. Like many, it has seen bad times and was largely destroyed by fire. It has been heavily restored in keeping with how it once was. I noticed only a few other duos or trios of tourists, braving the fierce chill in this draughty stone place. Finishing up in the bookshop and little café my parents and I each had a bowl of piping hot vegetable soup to return some warmth to our extremities. Driving south we passed turn-offs to a few villages – Rodern and Rorschwihr. Vineyards stretched away on both sides of the road. We stopped at Bergheim. A spur of the moment decision really. I was navigating and giving directions. We came to a roundabout and I said, ‘Well, this must be Bergheim to the left. Let’s do a drive-through.’ (My slang for let’s have a look at the village from the warmth of the car rather than getting out and walking.) Just as we went through the roundabout we saw a car park and all decided that actually, we would get out and poke around despite the cold. You never know if you’ll be back so the ‘seize the day’ mentality often prevails. 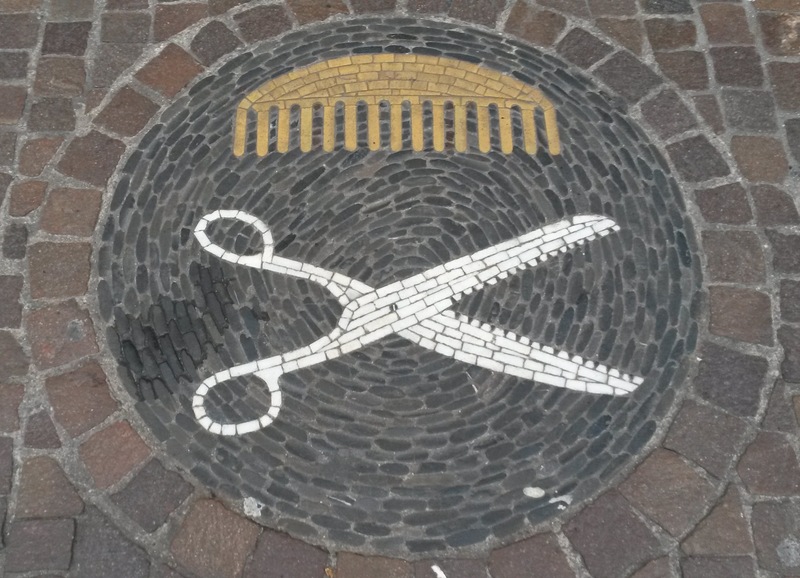 Well, Bergheim was a little gem! 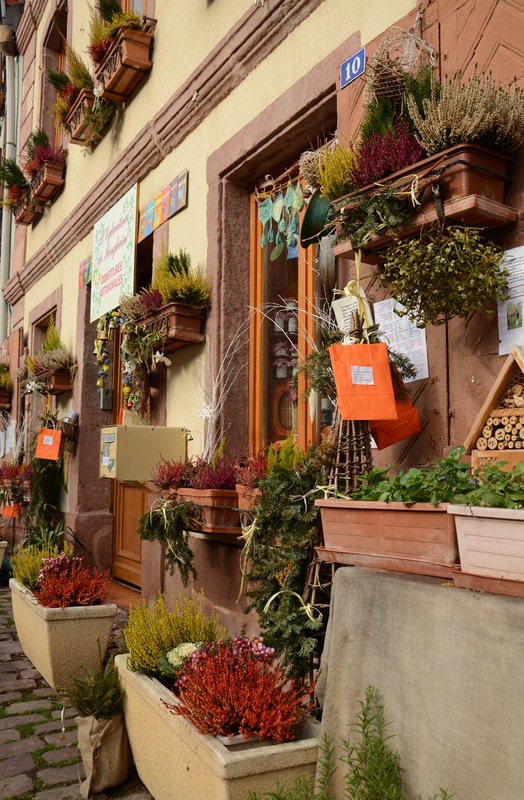 Cobbled streets, ramparts with towers, views across vineyards, tiny herb gardens, immaculately preserved houses – the village was definitely worth exploring. It was quiet, barely a person in sight. A couple of guys were taking down Christmas decorations, confirming that it does take two men to use a ladder, while the odd resident walked their dog. Mum and I found a quirky jam shop and chatted to the owner who makes all the jams, preserves and marmalades from fruit that she grows herself. Her speciality was wild rose. The raspberry jam (which was the perfect snack with our ficelle later on) was the fruitiest, most natural tasting dollop of deliciousness. While we were ensconsed in an education about jam Dad had dropped into a restaurant for a coffee. He was so delighted with the place – its occupants, the smells wafting through from the kitchen and the dog under one of the tables – that he sent us a text message saying he’d found lunch. I thought that the soup at the château was my lunch… But after perusing the menu and looking at the other diners and their food I thought that I’d be able to find room for the lamb shanks after all. This meal now ties for top place with the one I enjoyed in Eguisheim and was a superb birthday meal. The lamb shanks had been marinated in a honey and spice dressing and cooked slowly. The sweetness of the honey really was to die for. The accompaniments to this tasty piece of meat were creamy potatoes, broccoli (also with cream and some cheese) and braised endive. It was damn good. And even better with a pitcher of pinot blanc. Entertainment, while we ate, was provided by a gorgeous dog (yes, this is France and there was a dog in the restaurant during the lunch sitting) that was alternating between good behaviour and being playful (maybe because I was looking at him and making the noises I do when I see a beautiful dog). His owners were enjoying their lunch and telling him to sit every now and then. We chatted to the chef after our meals and I told him the potatoes were just scrumptious. Riquewihr was a short distance further south. Its outer walls still encircle the village. And they, in turn, are surrounded by vine-covered hills, as high up as a man and his truck can reach. 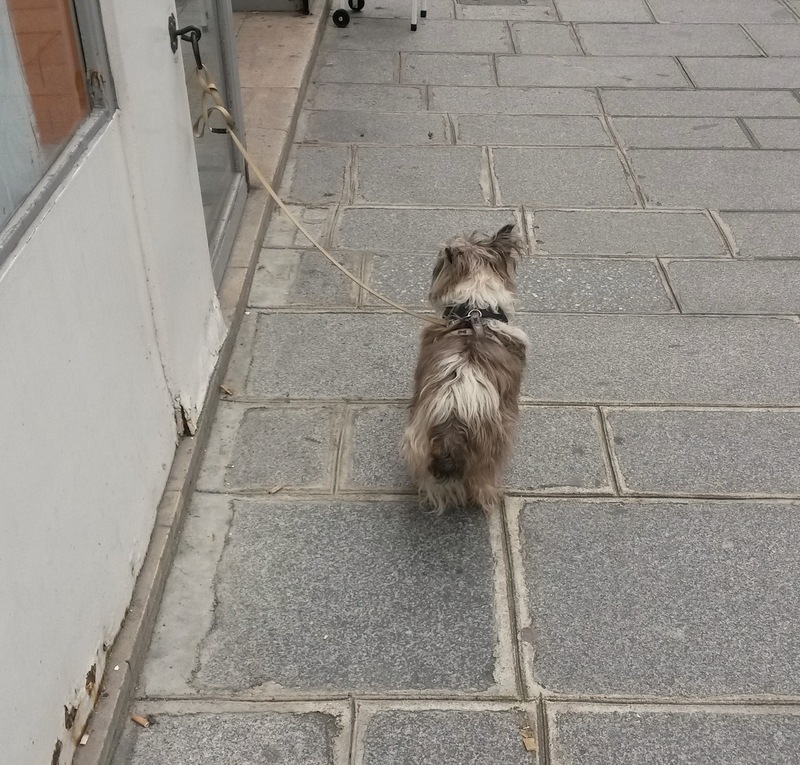 Once parked, and having dodged quite a number of dogs’ droppings, we found ourselves on the main street, leading uphill away from the town hall to the old city gate. Unfortunately the roar of bulldozers took away from the charm a little. A stretch of cobblestones had been dug up and holes gouged in this relatively narrow street. Further up, more machines seemed to be ripping apart several fire-damaged buildings. I watched for five minutes, then took a side street. However, finding that it was a dead-end I was back to the earth-moving equipment. Needless to say, with the noise and inability to access many side streets, as well as the waning daylight we decided to move on. Returning to Colmar and leaving the car at the Europcar office we took a bus back to our apartment and settled in for a night of ice skating – I came across a Swiss TV channel televising the European Championships Figure Skating 2014. Mum and I being avid ice skating fans we watched, enthralled, as the women glided, jumped, crash-landed in some cases, and spun around the rink in sparkly outfits. I always enjoy seeing how ice skaters personalise their skates – some like to go with a diamanté look, perhaps their initials, and others display symbols or some lucky charm. We watched till the end and saw Julia Lipnitskaia, a 15 year old Russian who was debuting, take the title. It was excellent viewing and a lovely end to a memorable birthday in Alsace. The German town of Freiburg is only an hour from Colmar, across the Rhine. It was our destination on 15 January, which was a crisp sunny morning. We navigated our way out of Colmar, crossed the Rhine (the border between France and Germany) and zoomed off towards Freiburg. 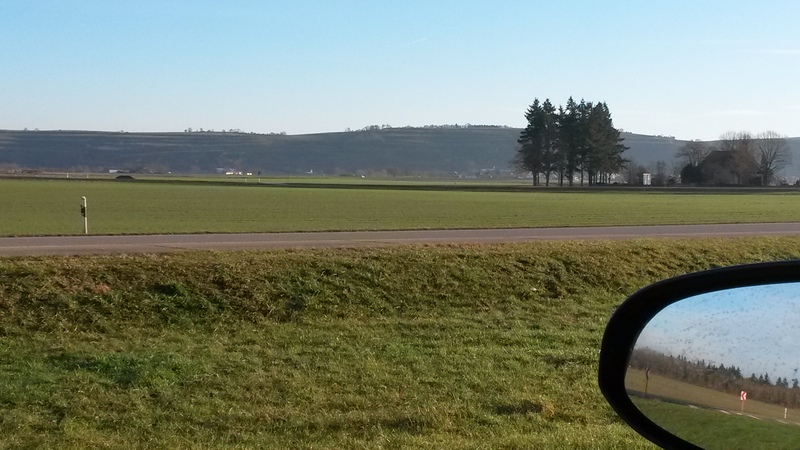 The mountains of the Schwarzwald (the Black Forest) appeared ahead across a flat expanse. The traffic slowed and after crawling for a few minutes we were waved over by a police officer to park in front of a line of other vehicles. We picked up a €20 speeding ticket from about 300 metres down the road. While we waited for the proper checks to be conducted I got out of the car and snapped a few photos (including a sneaky one of the cops). Out of nowhere I heard screeching and saw a car, that had been in the oncoming lane, speed around a bend, changing course. The driver swerved, never slowing, almost collided with another car and drove off. Every driver marooned by their speeding was looking by this stage, the nuisance of speeding tickets momentarily forgotten. The cops didn’t do much. I suppose I almost expected to see a chase, 007-style. My guess is the idiot behind the wheel saw the police (even though they were not focused on traffic on that driver’s side of the road) and became worried. 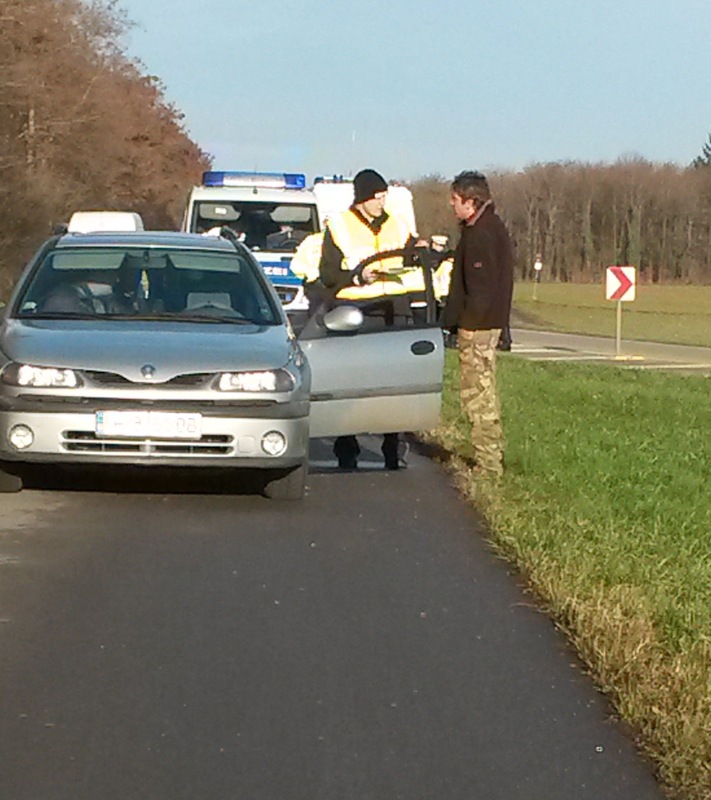 The driver had been heading towards the French border, so maybe he had dodgy cargo and fled after spying the police. After that excitement the drive into a ‘park and ride’ station in outer Freiburg was uneventful. The tram took us straight into the centre of the old town. It is an easy place to walk in, with many pedestrianised streets. We followed a circular walk suggested on a map, with a few diversions. 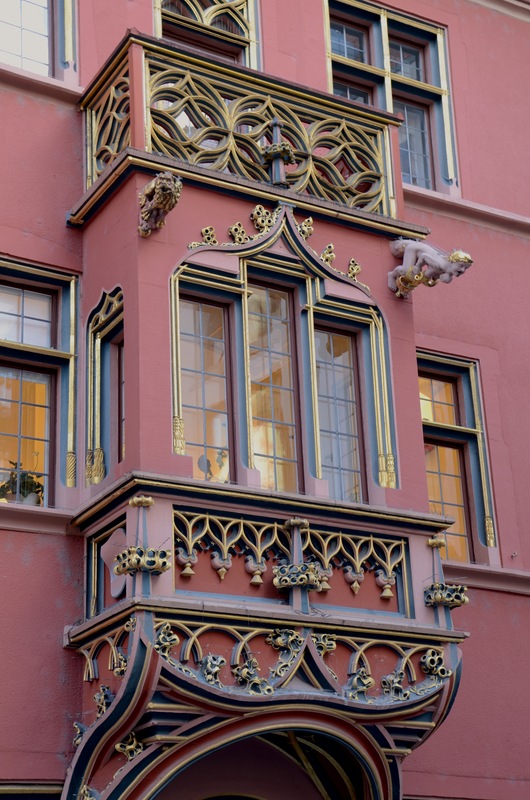 Erasmus had once lived in Freiburg, in a house near the old town hall, named the House of the Whale. The facade of the house is an odd shade of red and has a Gothic bay window above its doorway. The town’s cathedral was not far away, dominating a large square. A few market stalls had been set up selling fresh flowers, brooms and packets of spices. Statues on a fountain caught my eye amongst the bustle of the square and the pealing bells. Another bright building in the same shade of red as the House of the Whale stood opposite the cathedral. It was the important trading and financial point – the old Merchants Hall – and is decorated with the coat of arms of Hapsburg emperors. Our meanderings led us through to Konviktstrasse, a pretty street of shops and restaurants with gnarly vines growing up the sides of buildings and strung overhead. Students were filming a skit as I walked along and looked left and right taking in the creative designs in windows, architecture and people. 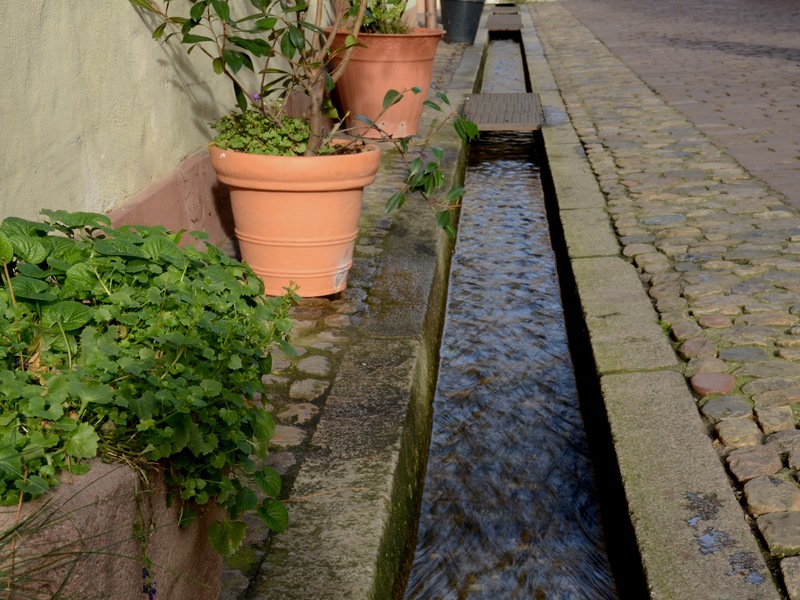 The little channels of water that run along the sides of many streets, known as bächle, are one of the quirky attractions that I’m sure every traveller to Freiburg mentions. They were once used for town water supply and fire fighting needs. They’re narrow enough to step across easily, or step into if you’ve had one too many steins of beer. I watched a pigeon in the cathedral square even hop across one, and then back again. Soaking up more of the town we passed Martinstor – one of the city gates, wrapped nicely in scaffolding – an Augustinian Monastery (that didn’t really pique my interest), plenty of shops and an exquisite confiserie that would do well for an afternoon cuppa a bit later. At that moment though, we were on the hunt for the Market Hall and lunch. It was described as a hall full of stalls with international food. We decided on some sumptuous looking Brazilian dishes. I was trying to communicate our lunch order with the few German words I recall, lots of pointing and a bit of English. Then I heard the two girls serving speaking to each other in Spanish. Asking if I heard right, I switched to Spanish and the conversation flowed with more ease. I told them I saw the stall and dishes and thought of my gorgeous Brazilian friend Debora and the amazing feijoada she used to cook. After lunch I got down to some serious shopping and had success with a pair of jeans and a couple of tops. 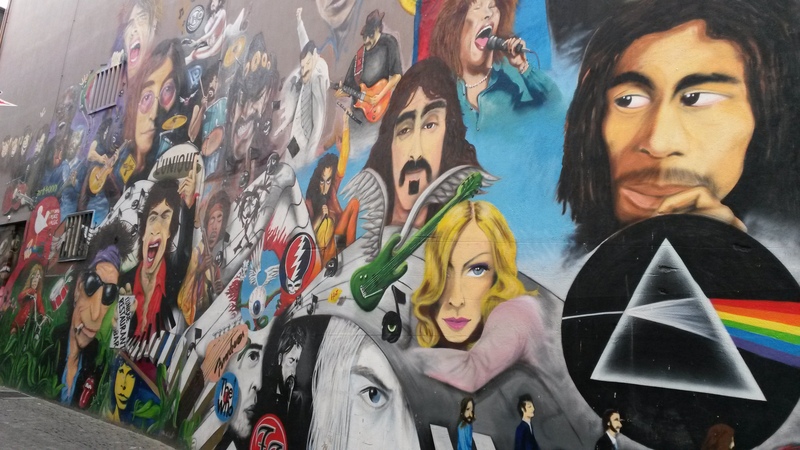 I wandered some more, turning down streets I hadn’t seen. 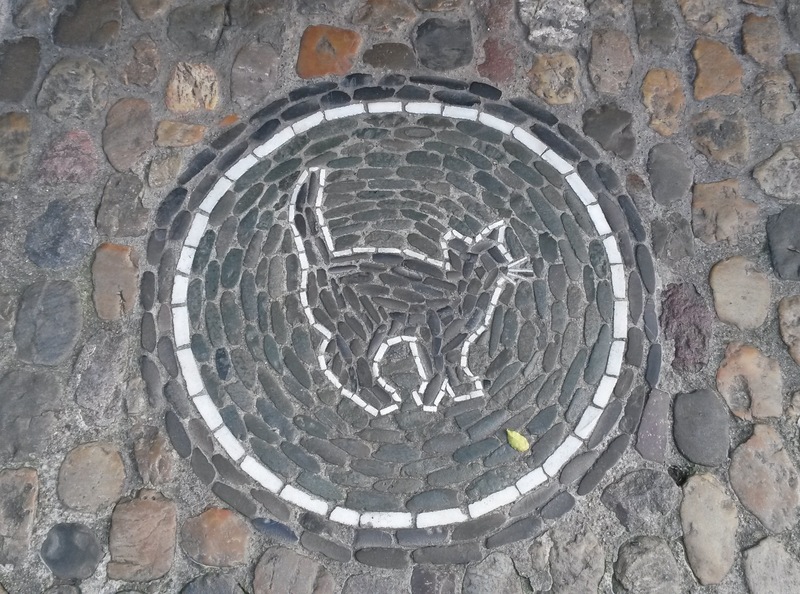 Freiburg’s footpaths are a great place to look as you walk because of the pebble mosaics all over town. Some indicate the nature of the shop they are placed before while others are simply geometric or artistic. Ready to warm up with some tea I was about to text my father when I saw him standing across the street from the shop. After trying to whistle and signal to him I only succeeded in attracting the attention of everyone but my father. He’d heard the whistle but looked in every direction except straight across the road at this waving Aussie with a couple of bags of shopping. I’m sure it was a bit of light entertainment for the passing residents of Freiburg. The lovely confectionery Gmeiner (the one we’d eyed off earlier) was a treat, with handmade chocolates, cakes, tarts and all manner of biscuits sitting patiently in glass cabinets waiting to be devoured. After a short pause we felt reinvigorated and ready to stroll some more. We passed the theatre and university then walked through Colombi Park at which point it was time to duck into more shops. I always think that when you find a place with some really cool shopping you’ve got to make the most of it, even if it’s mostly browsing and a little purchasing. Three scarves later I was happy. Driving your way out of a foreign town in the dark can be a bit of a challenge. We took a few wrong turns, but what’s a day’s travel without getting a bit lost, and kept to 80kmph. We were stuck behind a slow Frenchie on the road (surprise), with a stream of cars banked up behind us. Eventually one car passed us and the slow one, though in a pretty risky spot. Then, a huge lorry swung out and roared by. He gave the little car a blast of his horn and cut right in front of it, braking and forcing the little car and us to take evasive action. It was a ridiculous show of rude and impatient behaviour. The lorry was French and confirmed my view that I much prefer the drivers in Germany, even if their cops are a bit too efficient handing out speeding fines. There’s really nothing quite like the freedom of motoring along a windy road, away from the towns and cities, heading for the hills (reminds me of the chorus of a Natalie Imbruglia song – City). 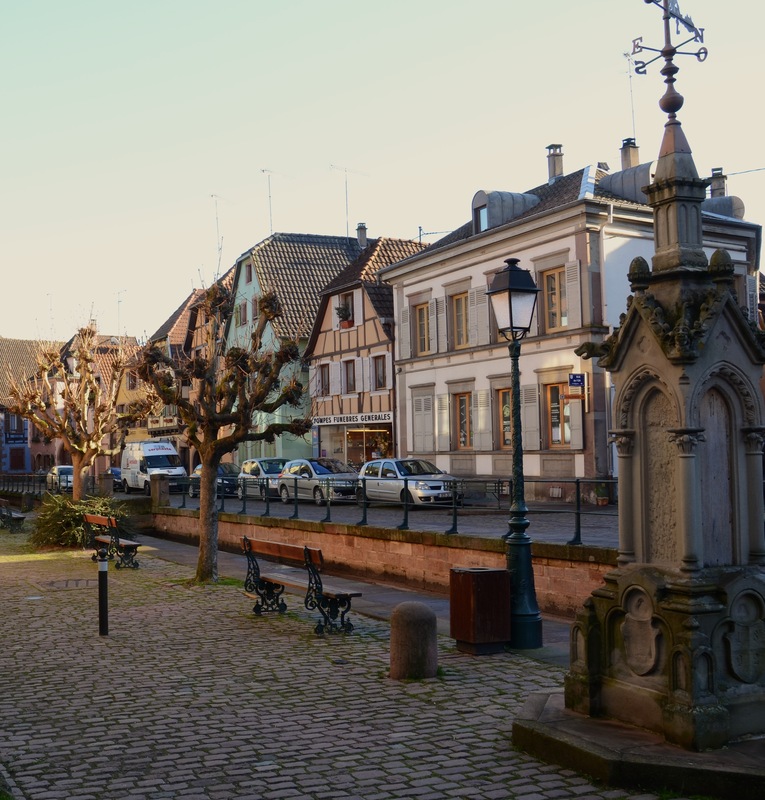 We took a local bus to the northern industrial zone of Colmar, to Europcar’s office, so we could rent a little Toyota hatchback and get some fresh mountain air. The first thing I noticed after stepping off the bus near Europcar’s office was the Statue of Liberty standing in a roundabout. 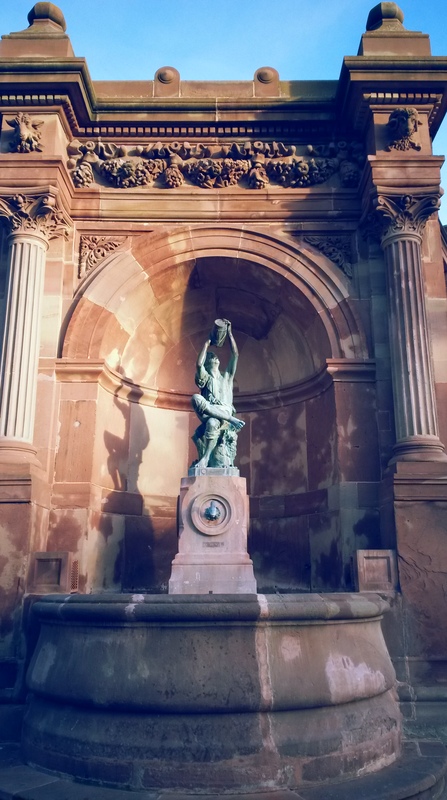 It’s a replica of the original and was sculpted to commemorate the centenary of Auguste Bartholdi’s death, who I mentioned recently in this post. Back in 1884 he designed the real deal that towers over the waters around NYC. 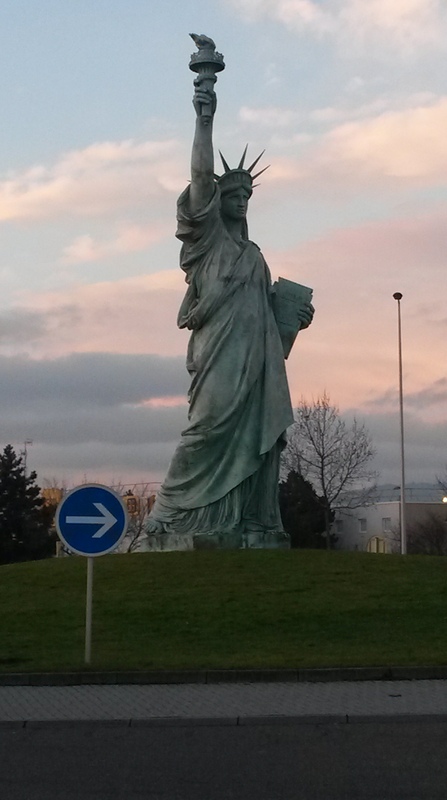 I was in that fabulous city back in 2003 but never got off the Staten Island ferry to actually see this lovely lady, so Colmar’s replica is the closest I’ve stood to her. We were out of Colmar in ten minutes and heading west. Turning off the main road at the Route of the 5 Castles was the beginning of the day’s adventure. This road wound uphill through the forested lower slopes of the eastern side of the Vosges Mountains. The Château du Pflixbourg was the first of the five castles on this road. 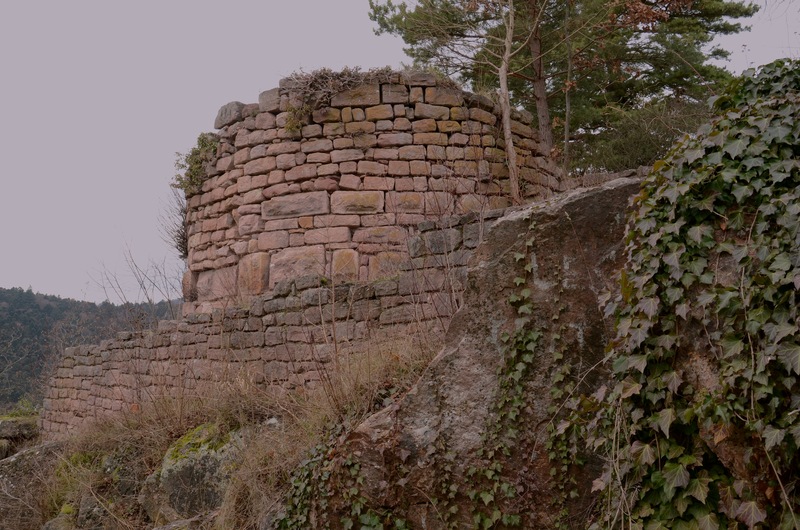 All that remains of the structure built in 1212 is a circular tower and parts of the walls (now draped in a green creeper like chocolate topping over ice cream). The castle was badly damaged in the 15th century and has been abandoned ever since. This accounts for its natural-like state in the forest. We followed a path from the road for 15 minutes passing through stands of trees and trampling on top of thousands of brown winter leaves. The rich and muted greens of various mosses and lichens stood out on tree trunks and rocks. 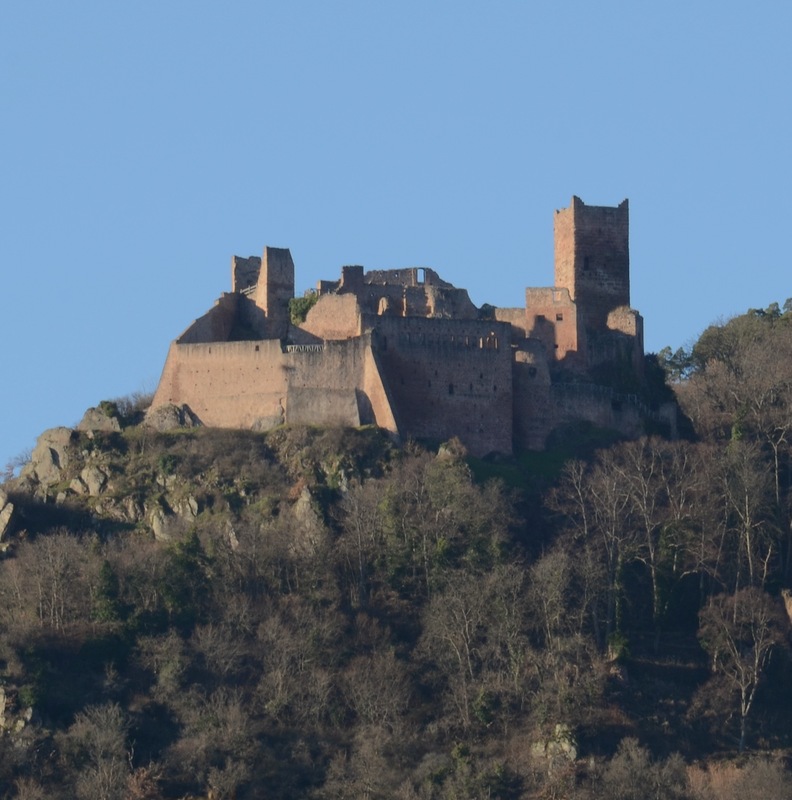 A short drive further on the large rectangular affair of the Château du Hohlandsbourg perches on the top of the valley. It is open for visits (with armour displays inside) during the warmer months. 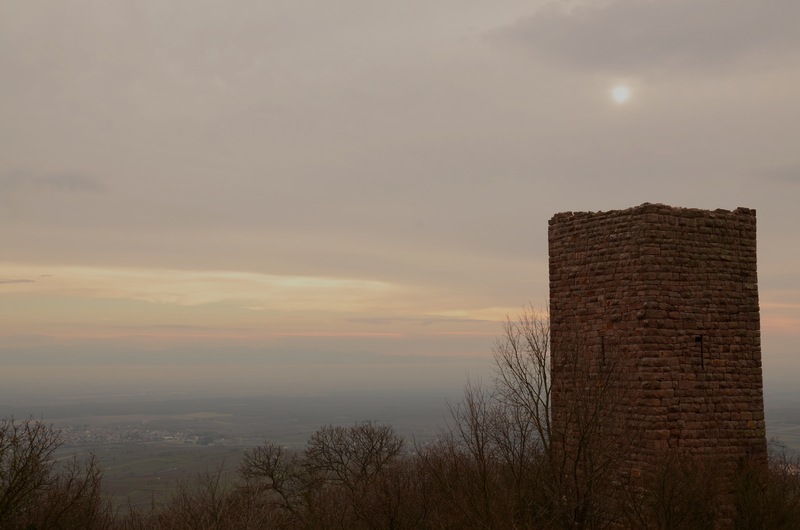 Today, a few workers continued with the winter restoration works on this 13th century castle. The walls of this one seemed to be in better shape than at Pflixbourg. The view out towards Colmar was misty though the distant mountains of Germany’s Black Forest were visible on the horizon. 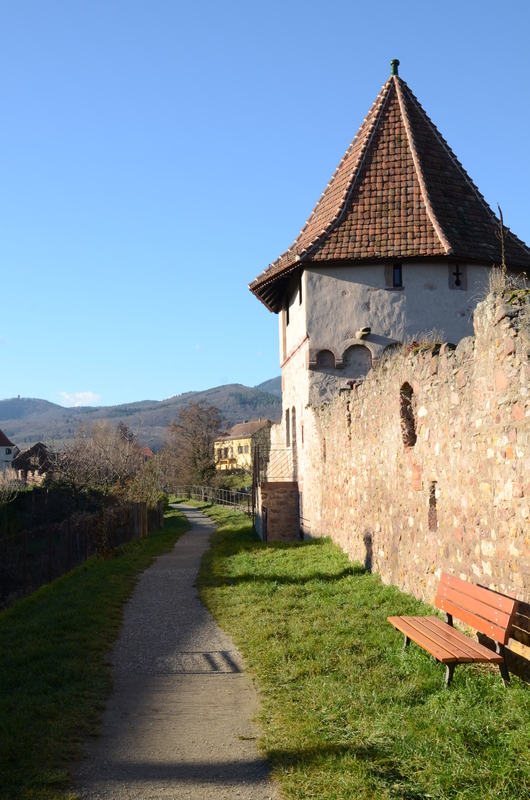 The castles of Eguisheim – three towers lined up on the mountain ridge – once formed a single fortress, built in the 11th century. Over many years and many changes in succession, ownership of the property was divided. 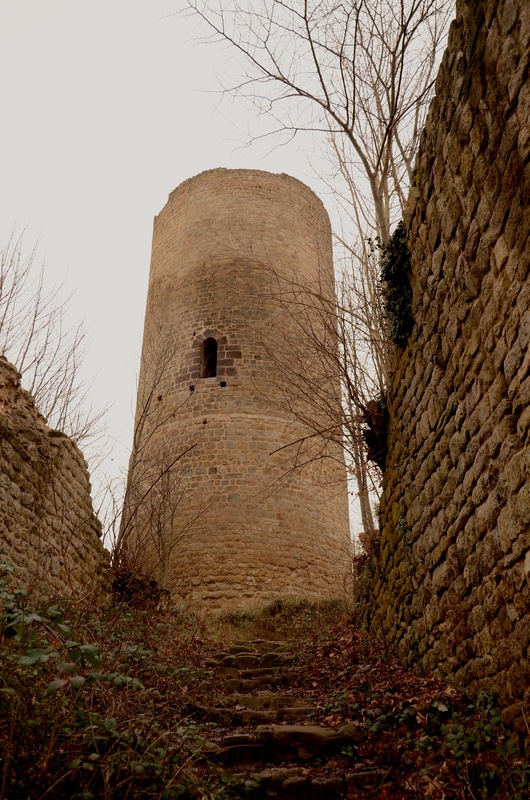 The three towers that dominate the hill today are Dagsbourg, Wahlenbourg and Weckmund. We were the only visitors stepping among the ruins of these towers. Though it seems from a distance that the towers are the sole remnants there are a number of other ruined stone structures – an arched doorway, steps, a well and walls. Like Pflixbourg, nature has done its duty over the centuries. Even the stark twigs and thorny branches of a vine had found a way inside one of the towers and protruded from a tiny hole at the top. Following the road down from the forest to the village of Husseren-les-Châteaux we drove through the foothills of the mountains, covered with vineyards in every direction. This is prime winemaking country towards the southern end of the Route des Vins d’Alsace. 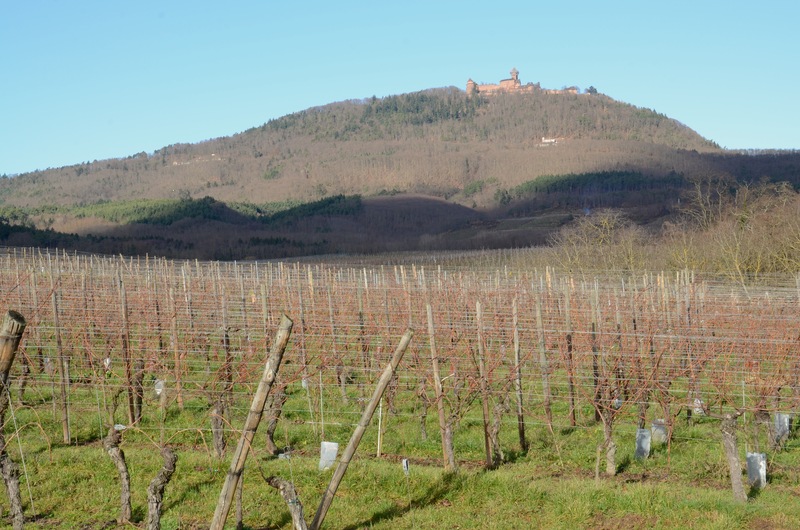 Even in the frosty, overcast conditions workers and their trucks were dotted throughout the vines, ploughing and maybe doing some early pruning. The village of Eguisheim spreads below its three towers. Before exploring its circular streets we hunted for some lunch. Being a Monday in winter the choices were slim. But we found a lovely place opposite the village school. This meal goes down as my best yet: sanglier (wild boar) marinated in red wine, served with red cabbage and spätzle (egg noodle formed into mini dumpling shapes – like tiny gnocchi and the perfect starchy accompaniment to soak up the rich red wine sauce). Dad also chose well – pork knuckle, deliciously tender, with potatoes, chestnuts and a salad tossed in a light mustard-based vinaigrette that only the French can do so supremely. We cleaned our plates, enjoying the hearty fare with a pitcher of local Riesling. As we walked around Eguisheim after lunch the sky took on a rather foreboding shade. The half-timbered houses in this village line every cobbled street. 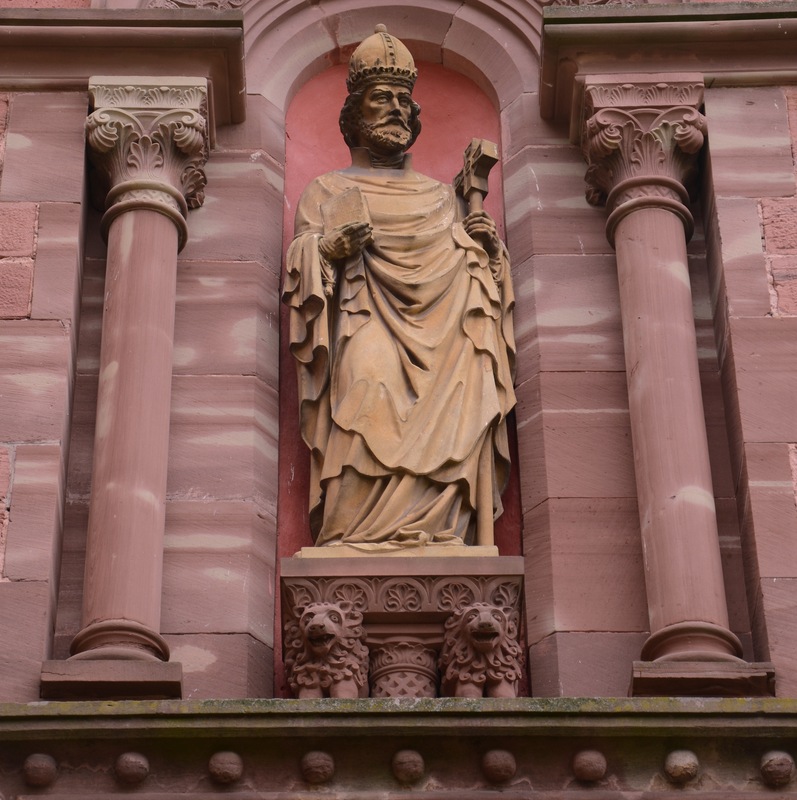 There is a small castle in the main square, next to the chapel named after Pope Leo IX who was born in 1002 (a snippet you may need for your next trivia night). Leaving Pope Leo to his stony, wintry square we set off home as the rain closed in for the rest of the afternoon. You could fire a rifle down the main shopping street of Colmar on a Sunday without hitting anyone. If you wanted to, of course. The Colmariens either bunker down at home on Sundays or take a drive in the countryside, for they are nowhere to be seen in the centre of town. I decided a couple of days ago that I felt like a trip to the cinema and figured that Sunday would be the perfect day – most of the shops are closed, none of the museums in town are open for another month or two and even Monoprix (the supermarket) is shut. But the cinema was open! 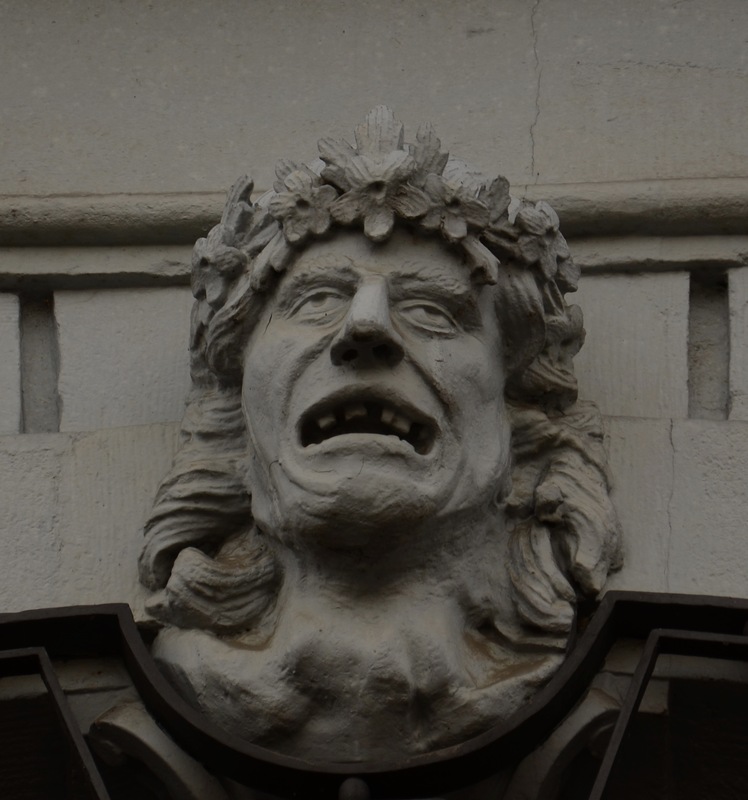 The website indicated that the Cinéma Colisée in Colmar was showing a few films en VO (original version, i.e. not dubbed). One of them was the Wolf of Wall Street. It suited me and I thought a movie on a Sunday afternoon sounded like a grand plan. So, Mum and I trotted off with enough time to walk there, queue (thinking Sunday afternoon movies might be busy) and buy tickets. We got to the cinema at 1:00pm. The doors were closed and the lights were out. The timetable on one of the doors confirmed the information I’d found on the web: Le Loup de Wall Street at 1:30pm. It was dead quiet. I was perplexed but determined to see my movie. I bailed up a lone passer-by. He said he didn’t know about this cinema but knew there was a bigger one around the corner. I’d found that one too, and it only showed films in version française, dubbed. We walked there anyway, to see if staff there could shed some light on the situation. If the Colisée was in the land of the dead, the bigger complex wasn’t far behind. A few random souls wandered in the empty foyer area (for a second my thoughts drifted…was I in an episode of ‘The Walking Dead’?). The ticket offices were unattended with their security gates up. The candy bar was also shut, lights off. And, a length of security ribbon (the type you see at airports) was firmly barring the entrance to the cinemas. This was all very perplexing. I considered sneaking under the security ribbon (or maybe even doing the limbo under it) to peek into a cinema and see if there was any life. Instead, I spoke to a few of the Frenchies in the foyer but all gave me rather vague answers. When I asked them about the Cinéma Colisée, just around the corner, they appeared to have never heard of it. I stood my ground at the candy bar, waiting and watching. After a while people began emerging from the cinemas and an employee came down to open up the candy bar. I asked her about the Cinéma Colisée but she was really busy rearranging bags of M&Ms and simply told me the two cinemas are not connected, mademoiselle, and she didn’t know anything about the Cinéma Colisée. With a prompt merci, au revoir we walked back to where we started and I looked at the timetable again. The film we wanted to see was the first to be shown for the day. It suddenly occurred to me that the cinema simply hadn’t opened yet. It was now 1:15pm and the movie was to start at 1:30pm. We hung around, standing in patches of sunlight and shifting from one foot to the other, to keep warm. I sensed it was all going to work out as a woman arrived on her bike, took out some keys and unlocked a side door. She didn’t unlock the main doors until 1:27pm, but I guess this is just how they roll here on a Sunday arvo. As for the film…I thought Leonardo DiCaprio was excellent in his role as Jordan Belfort. The excesses of such a lifestyle were shocking, but portrayed well. It was a touch long (especially in an overheated French cinema) but overall amounted to a very pleasant Sunday afternoon. Walking back, we noticed there were a few more of Colmar’s inhabitants around and a couple of bakeries open. What is life in France without bread… We passed the covered market, with its collection of stalls inside selling knick knacks, cheese, charcuterie and vegetables. 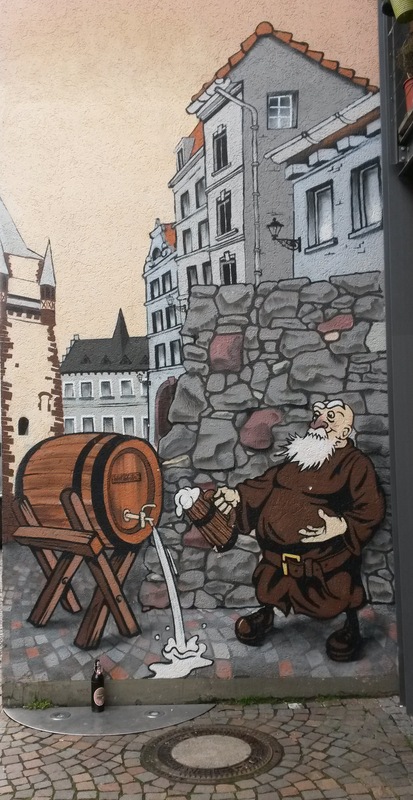 I found a very likeable fountain tucked into an exterior alcove of the building – a relaxed looking chap enjoying a drop from his wine barrel. 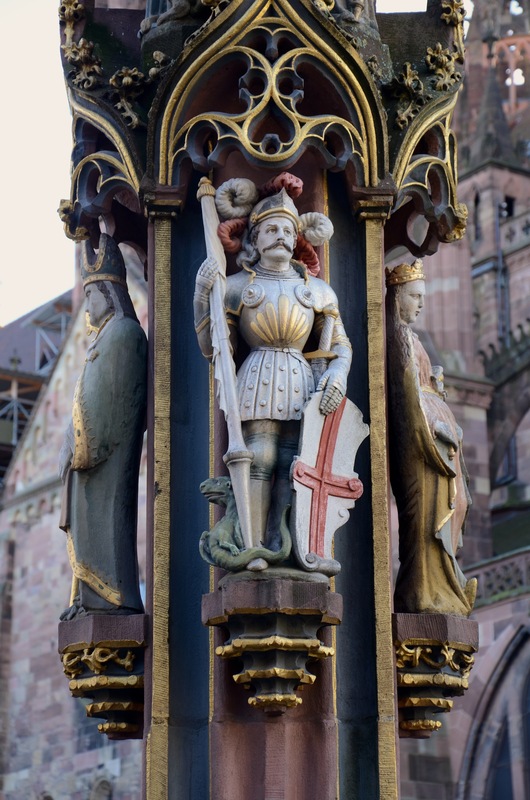 The statue is said to represent a wine grower which is fitting since this area of Alsace is known for its grapevines and wine. 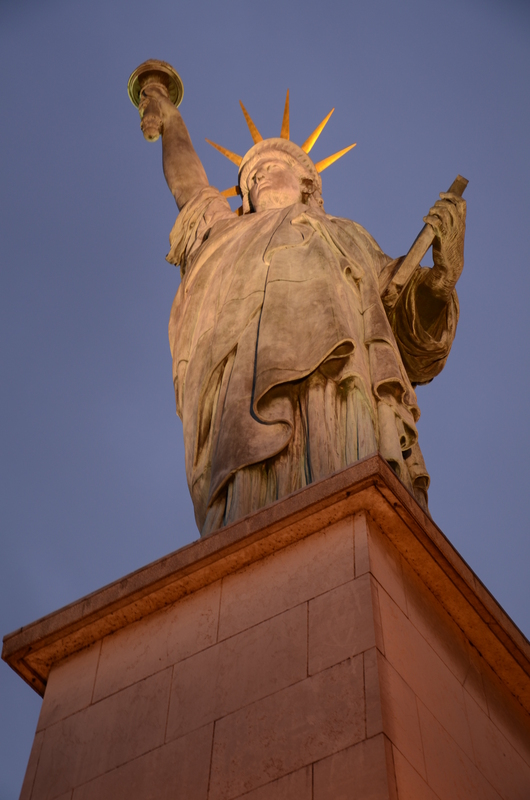 It was sculpted by Auguste Bartholdi, a native of Colmar who went on to create some pretty big sculptures. Making our way down the final rue before we would turn the corner to our apartment I paid a little more attention to the buildings in this street. I had noticed the signs on buildings on our first day – police and judicial buildings. There were a few parked cars branded with the gendarmerie’s logo on their side and one that was just pulling up. Slowing my walk so I could watch and eavesdrop I saw three uniformed police officers (les flics as they’re known in French slang) get out of the car with an ordinary looking guy. No words were exchanged – maybe I need to work on being a bit more unobtrusive. One of the buildings further up had bars on all the windows. I did a bit of research later and discovered that we are living around the corner from the police watch house and a sizeable jail. It was built in 1316 as a convent. The nuns were turfed out in favour of prisoners in 1791. It acts as a watch house and a home for prisoners with sentences of no more than a year. A bit more research led me to a few news stories recounting escapes or attempted escapes by inmates. A little over a year ago, three inmates managed to put a decent hole in the ceiling of their cell, using a table leg, then climbed on to the roof, down another building and tasted freedom for a week. In June 2013 several inmates attempted to escape, using a similar method, but were caught. In August 2013 a man facing sentence in court (also in the same street) fled via the window after the judge handed down his sentence. The cops had him outside. Still, he actually managed to get out through the window…! I contemplated this information briefly, more interested than perturbed by the fact that I’m living around the corner from a jail. Convenient, actually. If one happened to fire a rifle on a Sunday afternoon and found oneself in a spot of bother, one would not have far to go to reach the watch house. The train from Colmar to Basel took about 45 minutes, stopping at Mulhouse and Saint-Louis before crossing the border into Switzerland. A few customs officials strode through the carriages of the train but other than that no one checked tickets, passports or anything else. I thought this was interesting, given that Switzerland is not actually part of the European Union. I have never been to this landlocked country so Basel would give me my first taste. The city is situated almost at the exact meeting points of France, Germany and Switzerland. It seemed colder when I walked out of the train station, yet Basel was further south. As I walked I heard German, French, Italian and other languages buzzing around this cosmopolitan city. The sales were in full swing here too, though at rather expensive Swiss Franc prices. A long shopping street led down into the old town, which hugs a curve of the Rhine as it passes through on its way back towards Germany. The street opened out onto the Marktplatz with trams bustling by on one side and the Rathaus, the vivid red-coloured town hall, on the other. A grand building opposite the Rathaus housed some old tea rooms. We settled in at a table on the second storey, with a perfect view of the square and the town hall. The tea was served with delicate saucers and teaspoons on small trays. It was all very lovely in that tea-ritual sort of way. The apple strudel I chose was superb! Flaky pastry, luscious pieces of apple and a dainty jug of crème anglaise that I just wanted to dip my fingers into. We found our way to the tourist office to pick up a map then set off. 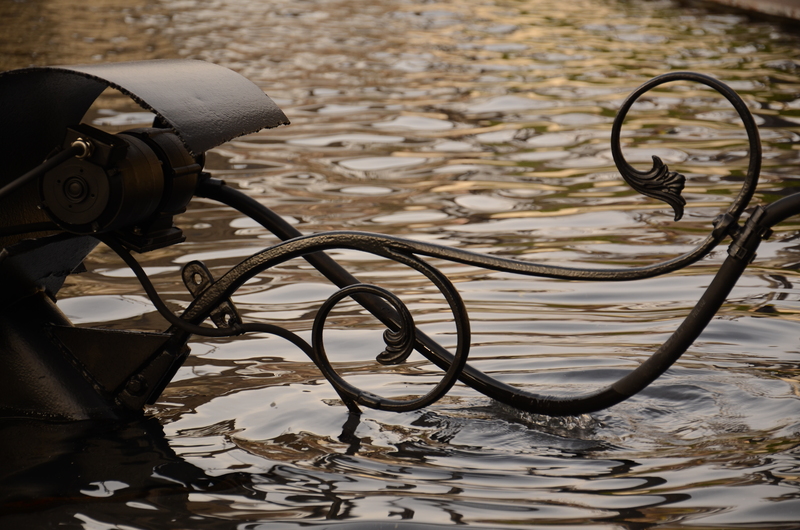 I quickly noticed a fountain across the road that I’d read about – the Tinguely Fountain, named after a Swiss artist who designed this marvel. This is no ordinary fountain. It’s made up of nine different works of iron that scoop, sieve, spray and spurt water. There was so much movement, of machinery and water, that it was hard to concentrate on just one piece at a time. A group of Russian tourists sauntered by, their leader talking rapidly into his mike. The cathedral sits up high on an embankment overlooking the Rhine and the rest of Basel to the east. Apparently Erasmus is buried inside. I couldn’t find his grave because there was a small service taking place inside the cathedral and some areas were cordoned off. The roof of the cathedral reminded me of the one in Vienna, with its coloured tiles that display a beautiful geometrical pattern from a distance. Following a street downhill from the cathedral square we passed buildings that were 700 years old. The architecture here seems more stately and has a regal air about it. There weren’t as many half-timbered houses, and buildings (with the exception of the Rathaus) were painted in fairly muted colours. 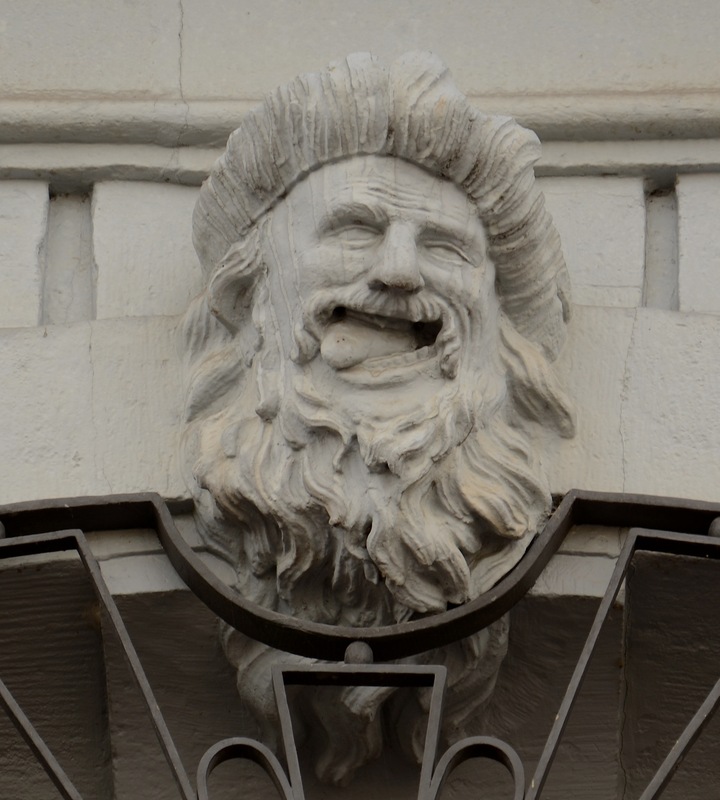 I looked up at a pale blue building, noticing sculpted heads above the windows. The expressions on some of the faces looked like they were grimacing or cackling. 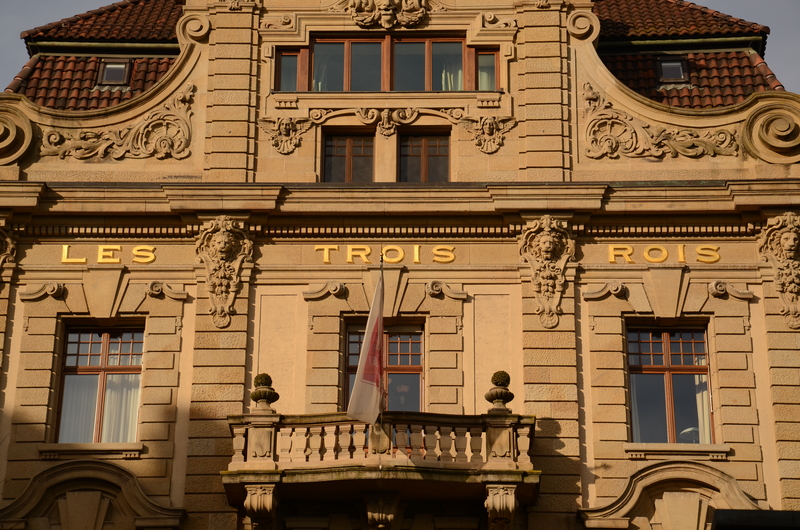 Despite being the home of Roger Federer I didn’t notice any tennis courts in Basel’s old town. There are plenty of museums and galleries here though, showcasing old masters, sculptures and modern designs. Deciding to wander round and enjoy the sunny day rather than hole up in a museum for an hour or two, we climbed more of the city’s hilly streets after a quick lunch at a vegetarian cafe. The university in Basel is one of the oldest in Switzerland and provided us with a nice shortcut when we were trying to find our way across a busy street. We’d obviously entered the scientific part of the campus as signs indicated parking spaces for the Secretary of what sounded like the zoology department. An old city gate still stands at one end of the old town, but was unfortunately covered in scaffolding. Wending our way back to the train station we had a little wait for the next train back to Colmar. The waiting room had a ridiculously high ceiling and wooden benches along its sides. We hadn’t been there long before an older guy in a woollen hat (the type of beanie with extra side bits to tie under your chin) and velcro walking sandals (bare feet inside!) sat down across the other side of the room. He rummaged in his backpack for a few minutes then pulled out two mobile phones. I wasn’t really paying much attention initially as he spoke quickly on one of the phones. It was only when he switched his device to speaker phone and his voice rose several decibels (I’m sure it wasn’t just the echoing acoustics of the room) that I began to take an interest. I worked out he was speaking in Italian. He was basically rattling off numbers to someone on the other end: due, sette, otto – tre, due, cinque. A fairly simple set of numbers. Clearly, there was some additional confusion as the next ten minutes saw the man continue to repeat these numbers, interspersed with typical Italian gesticulation, and enter them (I suppose) into his second mobile phone. He was oblivious to the entertainment he was providing. It was an excellent lesson in Italian numbers 1 – 10 and a pleasant distraction while waiting for the train.